World Economic Forum hosted an annual summit in Davos, Switzerland, where world leaders are gathering. In the summit heads of the governments, accompany with cultural and business influential will discuss different issues prevailing in the world. Few prominent leaders such as presidents of UK, US, and France will not attend the summit due to internal domestic issues. In the summit where different global issues are going to be discussed, the issue of world economic inequality will also be under observation. According to the Oxfam briefing paper – January 2019, the number of billionaires has increased as compared to the past. Where In 2008 there were only 2208 billionaires found, and the number of these wealthiest people reached to double in 2018, only after ten years. According to the report, as the ratio of rich persons have increased, there were 43 richest people were noticed down who had as much wealth as 50% poorest of the world own in 2017. 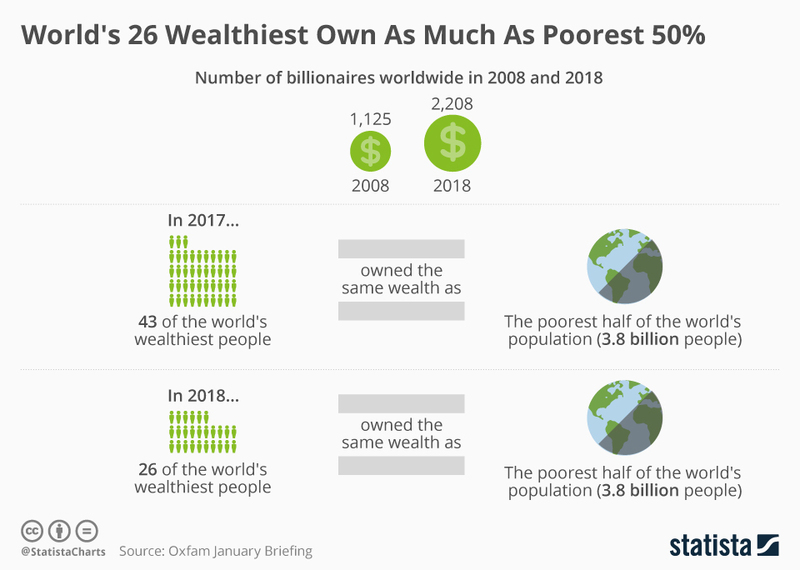 And in 2018 only 26 wealthiest persons were found, who have equal wealth to the poorest half of the world. The OXFAM report stress on the immediate action should be taken against this approach of having 1% of people are having more economy as compared to other 99% collectively.